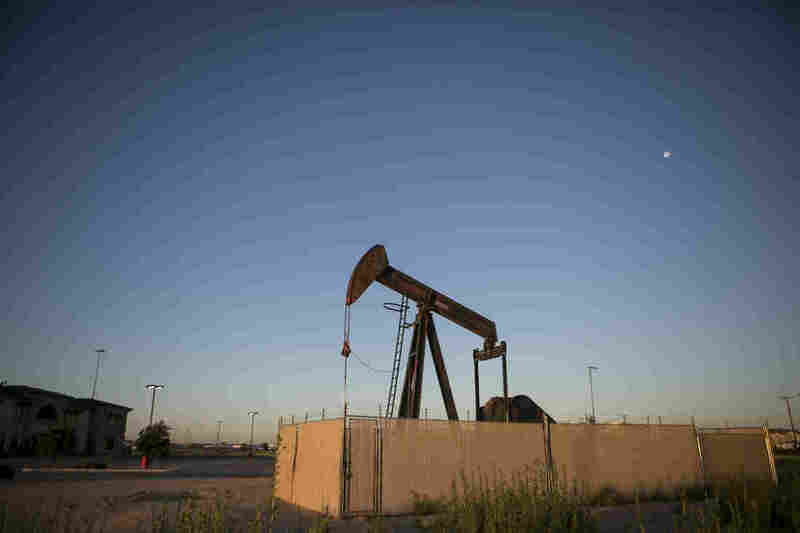 Texas Town's Fortunes Rise And Fall With Pump Jacks And Oil Prices The middle class has shrunk faster in Midland, Texas, than nearly anywhere else in the U.S. Overall, more people are getting rich than falling behind. But extreme booms and busts make life precarious. Pump jacks dot the landscape outside Midland, a West Texas oil town. Out on the wide open plains of West Texas, you can see the horizon for 360 degrees, interrupted only by the nodding up and down of pump jacks pulling oil up out of the earth. There lies the aptly named town of Midland. To get the hang of the place, you need to start downtown, on a corner near the Chase Bank, where an electric billboard displays the essentials: the temperature, a message — "God Bless Midland" — and a number. On this day, it's 45.94. 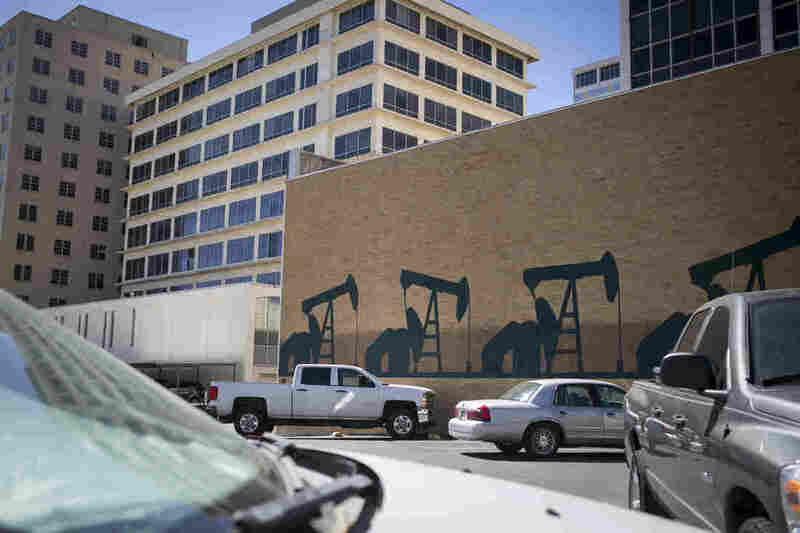 That number — the price of oil by the barrel — affects everything in Midland: whether people have jobs, how much they pay in rent, whether waitresses make tips. And that number helps explain why the middle class in Midland shrank faster than almost anywhere else in the country since 2000 — because so many people here have gotten richer. 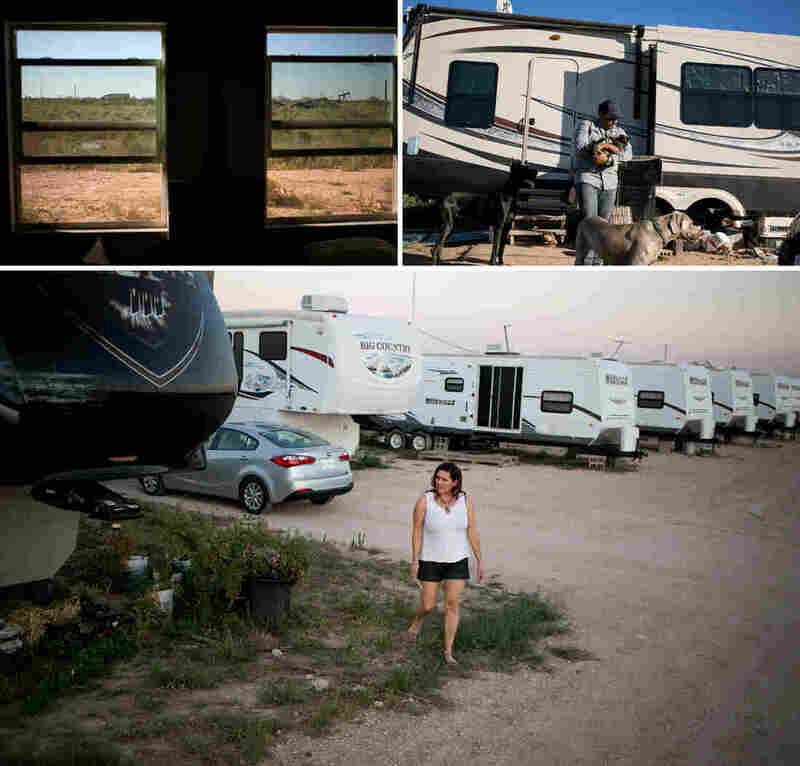 This boom-bust town reveals a complex picture of America's economic recovery. During the boom, people got rich. Stephanie Shelton, a 47-year-old lifelong Midlander, works at the community college. At one point, she says, the local McDonald's was paying new hires between $16 and $18 an hour. "When McDonald's is hiring at $16 an hour, you can imagine what dentist offices are paying or hospital reception is paying," Shelton says. But when the bust comes, "you have vacancies everywhere," she says. She points out two for-sale signs on nearby buildings. "You would never have seen that before," she says. A day in the life of Midland shows how it's an uneasy moment to be here. Oil used to be more than $100 a barrel. Now it's less than $50. Some of the people who got rich in Midland are now spending down their savings. Others have left. And some are hoping to use this downturn as a springboard when the next boom comes along. It's 8 a.m. at the daycare center Ed Mayberry and his wife Latoya run out of their home. Mayberry, 31, is also a pastor, who used to minister to oil field workers. When oil prices were at their highest, Mayberry says, the field workers would tell him about vacations in Hawaii and new car and house purchases. "Just a lot of material stuff," he says. But people didn't seem happier overall. "Children were raised with Dad kinda out of the house most of the time, so Moms were overwhelmed even during the boom," he says. Mayberry and his wife recently raised prices at their daycare center to $400 a month per child from $300. There's a waiting list, so they're hoping to move into a bigger space. And Mayberry is looking to buy a church where he can minister. "It's not to say that I'll be a millionaire next week or next year, but I feel like I'm kind of at a tipping point where all the momentum up until this point is kind of getting ready to tip me over," he says. In some ways, Midland's wild economic swings are nothing like the rest of the country; its boom-bust cycle is pretty extreme. But in other ways, the story of Midland does mirror the story of the U.S. In the last decade, two-thirds of Americans who left the middle class went up — they got rich. Only one-third who left the middle class sank down into poverty. It's lunchtime at the Mulberry Café. The owner, Jerry Morales, is also Midland's mayor. The Mulberry is the newest of three restaurants his family owns in town. 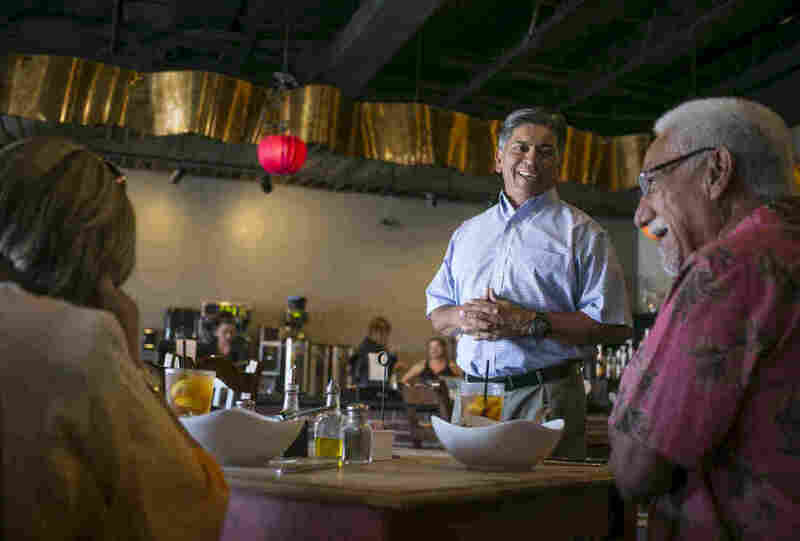 Running any restaurant — or any city — can be challenging, Morales says. But it's even more challenging when the tax income and the population ricochet all over the place from one year to the next. He says it's nerve-wracking just trying to figure out how much money to set aside for something like road infrastructure, for instance. "You get a report from your staff saying 30 percent of the roads are unrepairable, we need $112 million to catch up on that 30 percent, not including if we get another boom here in a year or maybe less, and you have a 13 percent increase in your traffic, you're going to have a challenge, that's scary," he says. "You're only going to get further behind." This holds true as a restaurant owner, too: Sales go up and down about 20 percent depending on the price of oil, Morales says. Everyone finds creative ways to attract talent: The mayor closed his restaurants on Sundays, offered employees free meals, flexible hours and insurance. Other places offered free shuttles to and from work. But when oil prices fell, everything changed. Thomas Carney got laid off from his job in the oil fields. He has six children and has lived in Midland for nearly 32 years. Three years ago, Carney was doing well financially: bills were paid on time, and there was money left over. Last year his oldest daughter went to the Rose Bowl with her school band and played the flute in the parade. He wrote the $3,000 check and told her to have fun. Not this year. "We cut all that out. And everybody's like, 'Man that's your kids' stuff.' I understand that, and she understands that," he says. Carney, who is 33, figures he has about eight more months of savings. He keeps applying for jobs, but nobody's hiring. If oil prices don't go back up soon, he'll leave town. By mid-afternoon, the Texas sun is blazing. Construction at the new amphitheater on the edge of town has stopped for the hottest hours of the day. The only movement is a pump jack nearby, slowly drawing oil up from the earth. Barbed Cross Construction is building the amphitheater; John Dunn is its 35-year-old CEO. He started the company about 10 years ago, doing handyman work by himself. He estimates he made about $150,000 by himself that first year. Now, the company does about $5 million annually in sales. When he realized he had finally left the middle class for good, he sent his wife and kids on a Caribbean cruise. Compared to other people in Midland, Dunn says, that's downright humble. "People spend stupid money around here, I mean stupid money," he says. "We've done residential remodels where people put half a million dollars into a $400,000 house." It's cliche to call America "the Land of Opportunity." And to many Americans, it feels like the phrase no longer rings true. But opportunity — and risk — turn up everywhere in Midland. Take Jesse Murillo and his wife, Megan Newman. Both 31 now, they met in college at Cornell, moved to the Texas plains, and bought a piece of property outside town. Jesse Murillo (top right) and Megan Newman (bottom) opened the Out West RV park, nestled between Midland and Odessa, as a long-term investment. Since opening the park, the couple have been living in an RV as they build their own home. "Just lots of brush and thorny things," says Newman, looking out at scrub and mesquite bushes. It's late in the afternoon, and the sun is low in the sky. The couple decided to open Out West RV Park and wait for the next boom to hit. Right now, about one-third of the spaces are full, and they both work second jobs. They've made sacrifices to get this far: They lived in an RV at the park for almost three months without water and electricity. Both of them grew up poor. Newman's mother emigrated from Poland. "She came over on a boat. All by herself, 19 years old," Newman says. "How much courage does that take?" And Murillo's family has roots in Mexico. "At a certain point we would bounce around from family member to family member. Because we just didn't have any food," he says. "I remember — I'm getting so choked up here — I remember one year, our bunk bed broke and we didn't have enough money to replace it, so we slept on the floor." With their Ivy League degrees, they could have gone into banking or consulting. But they wanted to build something of their own. They've already climbed out of poverty to enter the middle class. Now they hope that with the next boom, they catch a wave that will carry them even higher.